COMPASSIONATE CLIMATE ACTION: 59 Days - Climate Change Memes? I remember first reading about MEMES years ago in Adbusters, but have only recently been thinking about their importance in our work to safeguard the future. Now, this is just a blog, not an academic treatise, but I'd like to make a suggestion or two. First off, let's define "meme" (rhymes with "cream"), from definitions I've culled from a few different sources. A meme is an idea or cultural phenomenon that is passed on from one human generation to another. It's the cultural equivalent of a gene, the basic element of biological inheritance. Richard Dawkins coined the term in 1976, in his book The Selfish Gene, in which he said that humans can pass their ideas from one generation to the next, allowing them to surmount challenges more flexibly and more quickly than through the longer process of genetic adaptation and selection. A meme is a unit of cultural information that is transmitted from one mind to another, verbally or by repeated action. Examples I found listed as memes: the idea of God; social structure (importance of the individual versus family/group or tribe importance); a belief that the natural environment can be controlled; catch-phrases (just think of all the jingles you can still remember from commercials played during your childhood); the technology of building arches. 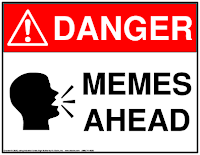 Meme is an abbreviated form of the Greek word "mimeme," which means "something imitated." Doesn't it seem as though the skeptics and deniers have a fully developed set of memes that they trot out continually, while the people who are trying to safeguard the planet for their children have come up with what? 350? The most important number in 350 is the zero. Zero carbon emissions. Hey, just leave the coal in the ground. It's not like it's going anywhere. Once we've got this whole thing figured out, you can go find it again. Global warming is the science of physics. And if you're scientifically illiterate, then you're going to want to go with someone who isn't, like a scientist who studies global warming. What's happening to the children in climate-ravaged parts of Africa today will soon be happening to our children. Greenpeace suggests fewer than six words for a banner ... so my memes won't make it onto too many bumper stickers, but then climate change "education" doesn't have to be about short sound bites. We still have, I hope, some patience for deep listening and learning. The other major difficulty is becoming explicitly aware that language, which is also part of the cultural commons, serves the same role in connecting generations of individuals as the DNA does in the realm of human biology. The analogy even holds to the point where a metaphor, like a mutated gene, can be seen as reproducing over generations the misconceptions of earlier thinkers. Just as genes influence biological development over many generations, metaphors, constituted in the distant past influence thought and behavior over many generations. The major difference is that we can make explicit the analogy that is reproduced in the use of metaphors such as traditions, individualism, intelligence, data, and so forth — and then identify analogies that give the metaphor a more current and ecologically accountable meaning. The shift from thinking of wilderness as wild and in need of human control to thinking of it as a pristine ecology with its own cycles of regeneration represents an example of our ability to change the meaning of words in ways that account for today's realities. This is my blog in case you wanna take a look. It's in spanish but has a translator widget in the right side. Thanks for writing! I like the idea of a translator widget, so thanks for that idea. -From the Blogger Dashboard, select "Layout"
There are 4 counters to choose from. Hope this works for you, Ana.